Krungthep (Bangkok) is both an excellent food city and a disappointing one. Excellent because Thai food is some of the finest fare on the planet – complex, multi-layered food made with very fresh ingredients – and disappointing because unlike some other cities in the world that are good food cities, Krungthep seems to be missing the sweet spot, that convergence of high quality, moderate price, and comfortable atmosphere. I’ve found any number of places that hit two of the three, but in the capital of the Thai kingdom, the culinary triple crown is elusive. The endless number of street vendors and air condition-less shop houses provide authentic, inexpensive food but without the atmosphere that encourages you and your friends to linger. In fact, they would rather you don’t linger so they can seat more guests. The fancy restaurants, often in hotels, have great atmosphere and generally good food, but will bankrupt you. And then there is this whole breed of restaurants that have opened in the last half-decade that are the result of hi-so Gen X’ers who have too much money and too little food knowledge. Their restaurants are popular as a see-and-be-seen place but the food always looks better than it is. 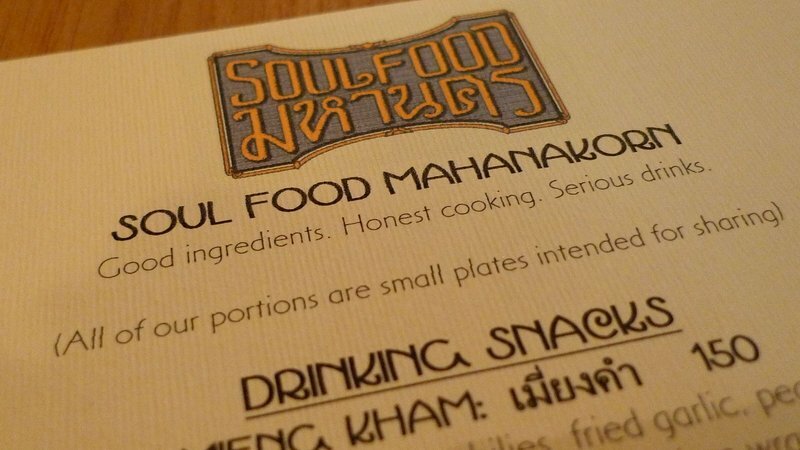 Which was why I have been so pleasantly surprised by a month-old arrival on the local dining scene: Soul Food Mahanakorn. Food writer Jarrett Wrisley (blog) whose work can be found in The Art of Eating magazine as well as the Atlantic Monthly’s food blog, is the proprietor and chef of Soul Food Mahanakorn – “Mahanakorn” is Thai for “metropolitan” – which is located a block away from my home on Soi Thong Lo. Earlier this year, I started reading the Atlantic Monthly’s food blog, impressed by the general quality of writing. 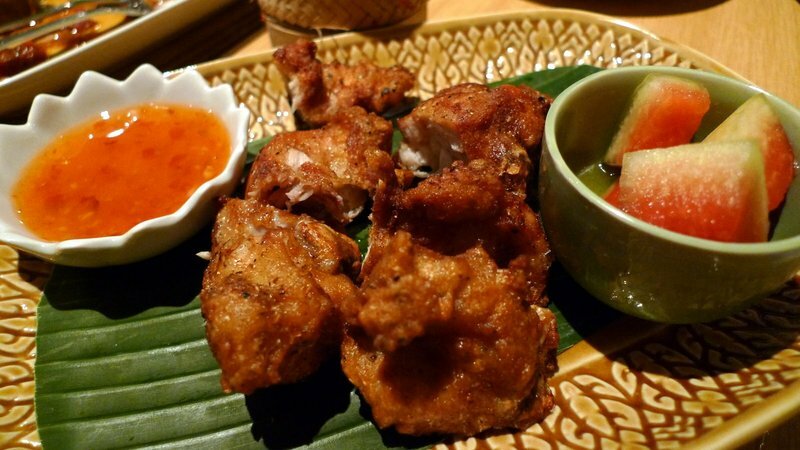 Jarrett’s articles about Thailand and Thai food caught my eye because unlike so many food and travel writers who are mired in cliches, he seemed to have a true appreciation for and understanding of the many facets of Thai cuisine. It didn’t take long following Jarrett’s posts to learn that he was in the process of opening a restaurant. Details came in bits and pieces but the menu’s tag line – “Good ingredients. Honest cooking. Serious drinks.” – sums up what he was writing about in his blog. It caught my interest: could I really find a restaurant in Krungthep that would be serious in its pursuit of good food without falling into the traps of either pretending or pretentiousness? And would that be delivered in an atmosphere that was convivial and at a price that wouldn’t place it in the only for special occasions category? Tawn and I were unsure exactly which day SFM (as I’ve abbreviated the restaurant in my mobile phone) opened, but took at chance and stopped by a month ago on what turned out to be their first night of business. I think we have the distinction of being the second table seated. We took to the place from the start. 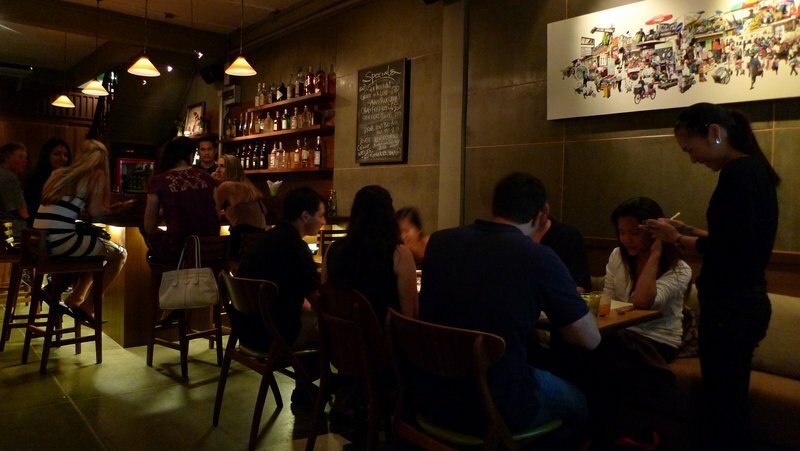 The interior of the three-story shophouse, which was initially a little hard to identify as you walked along the street but now has a lighted sign outside, has a welcoming atmosphere with a good-sized bar on the ground floor with perhaps eight tables between the bar and the front of the restaurant. More seating is on the second floor with the kitchen on the top floor. One imagines the staff must have well-developed leg muscles. The interior is welcoming, modern without being decorated in any specific motif. The wood paneling on one wall suggests perhaps a speakeasy in the Deep South but not in a Cracker Barrel sort of way. The chairs are retro 50s, custom made and comfortable for lingering over a drink. If you were to explain SFM in reductionist terms, it is either a Thai izakaya or a Thai tapas bar, depending on whether you want a Japanese or Spanish point of reference. What that means is that it is a drinking establishment that serves small plates of food. 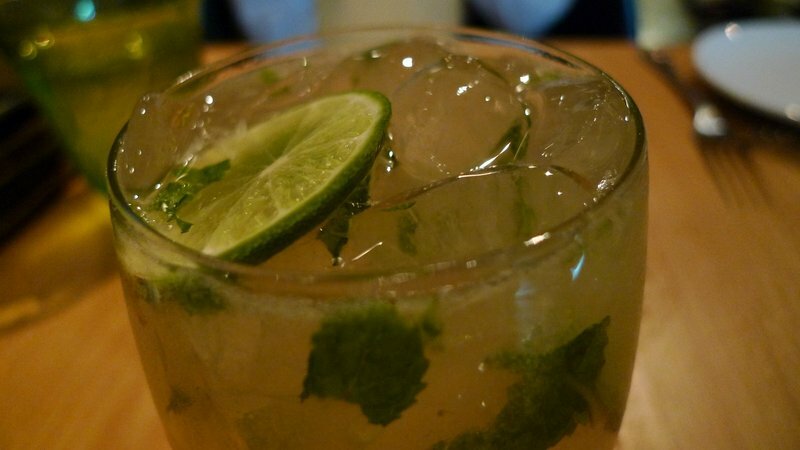 You can certainly eat well without drinking, although you would be missing out on some clever custom drinks that feature indigenous ingredients and generous amounts of liquor. There is also a smart wine list that offers some real bargains. But decor and good drinks, as important as they are, are not what is missing so often in Krungthep’s air conditioned restaurant scene. Does SFM deliver in the food department? We’ve made four visits in the month since they’ve opened and the menu continues to expand. Quality has been high since day one and the execution continues to improve as the kitchen team becomes more familiar with the menu and dishes and presentation are refined. The menu is largely what could be described as Thai soul food – favorites from each of the four major regions of the country along with a few dishes that creep in from elsewhere in the region. 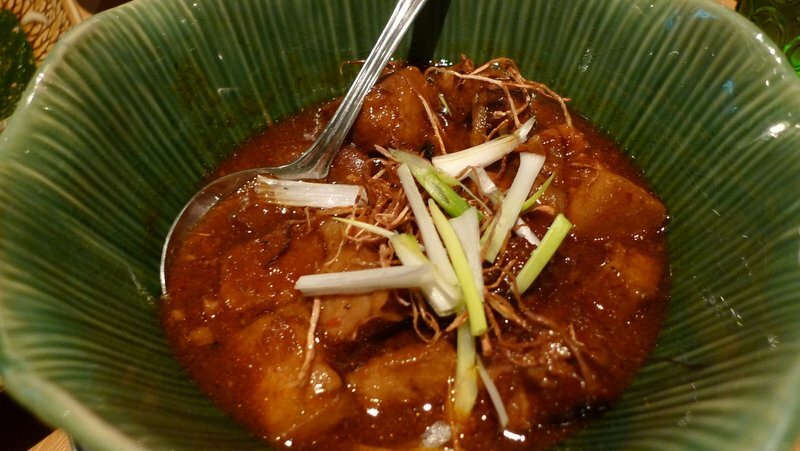 For example, the gaeng hung lay pictured above, a Burmese style stewed pork with ginger that is really tasty and inspired my recent experiments with braised pork with star anise. SFM is not fusion food – the food here stays pretty true to its roots. Jarrett takes some dishes and allows a little culinary license that honors the original but takes things to a new level. 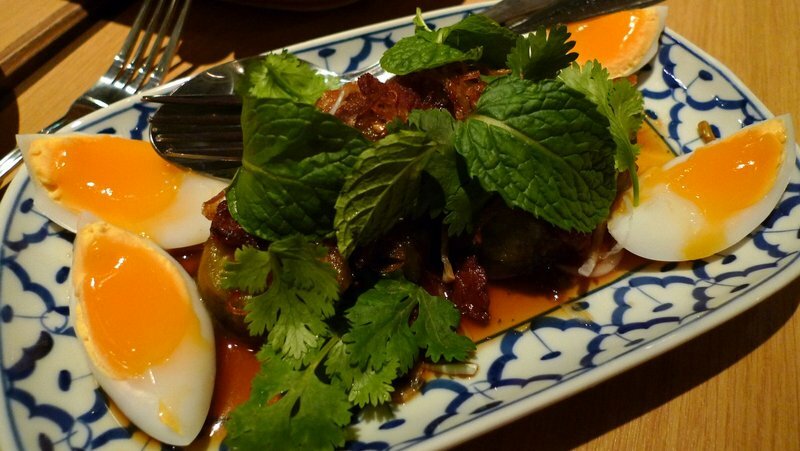 For example, one of my favorite dishes on the menu is yam makeua yao, eggplant salad dressed with a mixture of palm sugar, lime, fish sauce, and chili. The twist here is that he replaced the traditional minced pork with a little bit of bacon and added a touch of balsamic vinegar. I’m hard pressed to believe that any Thai mother wouldn’t agree that the dish is improved with these changes and would rush out to buy some balsamic vinegar for her cupboard. Another minor change is that the eggs, normally hard boiled, are served soft boiled. Reportedly, there was some push-back from his cooks but they have now accepted this change, which I think is delicious. It seems that nearly every culture has fried chicken as a comfort food, even before the Colonel’s global proliferation. SFM’s menu is anchored by a gai tod done up in the style of the Southern Thai city of Hat Yai – that means seasoned with a salty, spicy edge that you can’t get enough of. The dish is served with an interesting twist: pickled watermelon, a condiment that really reminds me of food from the Southern United States where pickled watermelon rinds are commonplace. 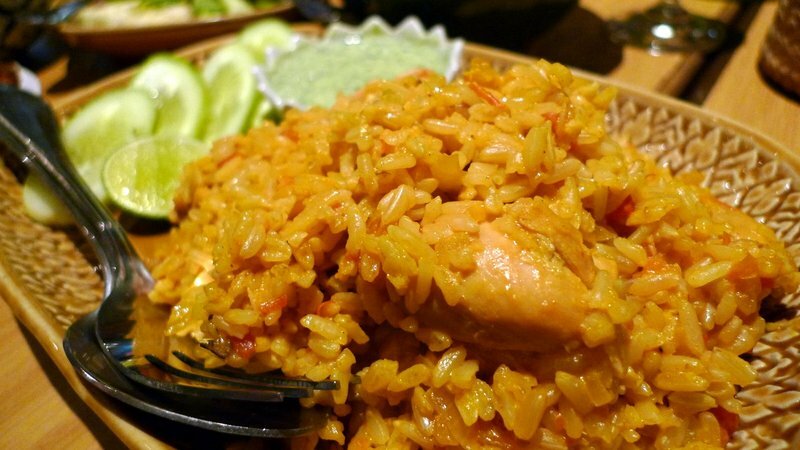 Another dish from the South (of Thailand, that is) is khao mok gai – a baked rice with chicken the roots of which trace back through Malaysia to India. You would recognize this as biryani and it was even served with a cooling yogurt and mint sauce. This dish has become one of our favorites and it is a good example where the attention to quality ingredients really pays off. SMF offers many specials based on whatever is available at the fresh market. This adds variety to the menu and ensures there is something new to try on each visit. 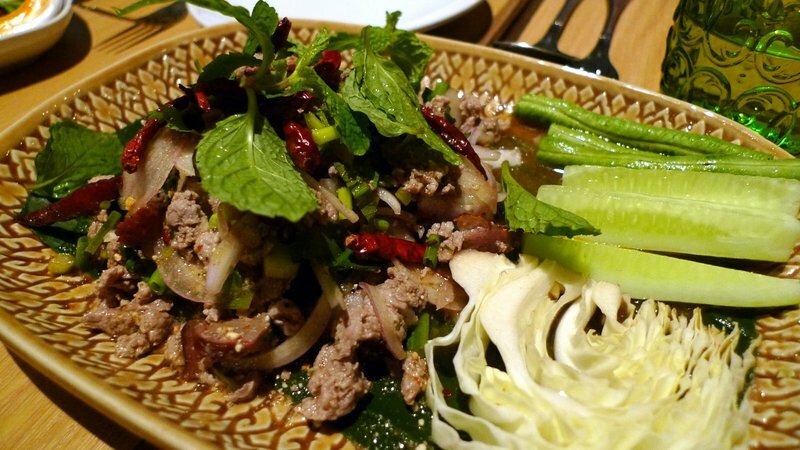 A recent special was larb pbed – a duck salad that is traditionally Issan, or Northeastern Thai. Larb is commonplace on Thai restaurant menus the world round and it features minced or sliced meat (often pork but chicken and duck are common, too) tossed with shallots, cilantro, mint, and uncooked rice grains that have been toasted and then ground. The dressing is made of fish sauce, lime, chili. What sets the SMF version apart is that it is made with smoked duck, which is a bit of an unusual and tasty twist to this classic dish. If you are worried about authenticity, though, there is no need to be. The Thais with whom I’ve dined have enthusiastically praised the food and the dishes are both instantly recognizable and recognizably spicy. Settings on the the Scoville scale have not been turned down one notch. 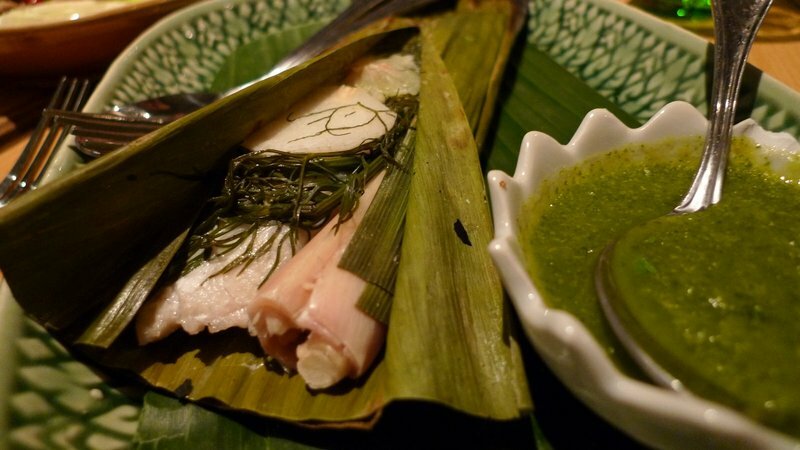 Another example of a “what’s fresh at the market” special is this sea bass baked in banana leaf with aromatic Thai herbs. This is how fish is commonly served in Thailand (although usually whole with head, fins, and tail attached) and the lemongrass, lime, and Thai dill infuse the tender, moist fillet with a very appealing flavor. The fish is served with a traditional spicy seafood sauce made of blended green chili, cilantro, and lime. 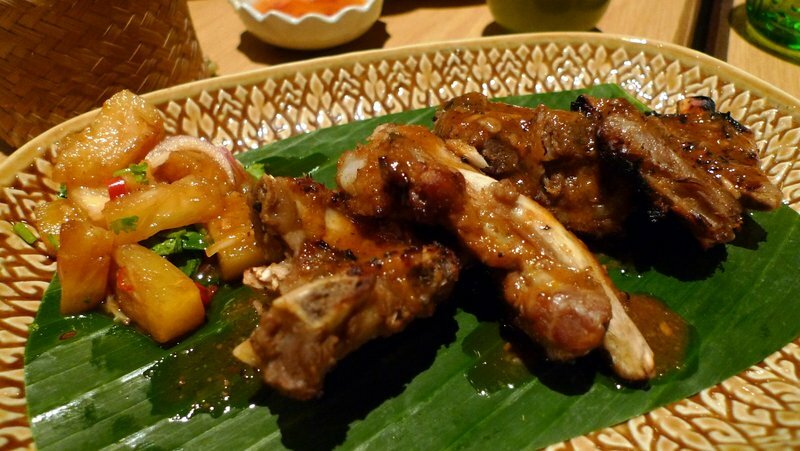 Another example of how “soul food” crosses borders is SFM’s tamarind glazed pork spareribs. These ribs will be familiar to any devotee of American barbecue but the sauce, which borrows heavily from the Thai sweet and sour flavors of tamarind and palm sugar, is something else entirely. It is served with a pineapple relish. The attention to detail in the kitchen and commitment to quality ingredients and well-made food are appealing. The atmosphere is friendly and comfortable, not too loud but not austere and minimalist. But what really makes Soul Food Mahanakorn work is that it hits that sweet spot I mentioned at the start of the entry. It not only delivers on its promises about food and atmosphere, but does so at a reasonable price. Dishes run from about 100 baht on the low end to just over 200 for specials like the sea bass. Drinks are about 150-200 but all are doubles. Over our four visits, we’ve been able to enjoy a filling, delicious meal including drinks for an average of about 600 baht a person, US$20. That puts it solidly in the once a week category. Hours are listed as daily on the website, but I believe they are closed on Mondays right now. 5:00 p.m. until late. This entry was posted in Uncategorized and tagged Bangkok, Dining, food, Jarrett Wrisley, Krungthep, Restaurants, Soul Food Mahanakorn by christao408. Bookmark the permalink. Yum! Yum! Thai style tapas! $20 per person for an upscale meal, may still be expensive for the average Thai, I suppose, when 3 baht can get you a bus ride. What is great find! When I noticed the statement on top of their menu: “Good Ingredients, Honest cooking, Serious Drinks”. I know this is a restaurant with a soul. No wonder it is successful. Bt the way, amazed me that you can analyze the food so well. Planning to open a restaurant sometime? looks like a neat little place! @CurryPuffy – 3 baht? Non air con busses are now 8 baht, Gary. Costs are rising! @yang1815 – Mark your calendar for February. @onmovement – Yeah, it really is. Reminds me a bit of something you might find on the west coast. @stevew918 – Open a restaurant? Nope. Let others deal with that headache! @christao408 – YAY YAY YAY!! !I would want to open one but yeah let others deal with the headaches. I just want to invest in one haha! @christao408 – 8 baht! What a ripe off of our hard earned baht! wow! That is one great place to have a meal that is satisfying. What a find! I hope the quality continues to get better. Put this on our must-eat-at list. that’s really cool, a thai soul food place. the kao mok gai looks so good. thanks for sharing- i’m going to bookmark it and make a variation one day 🙂 other than biryani, it also reminds me a little of the glutinous rice that chinese people would steam in bamboos or bamboo/reed leaves. Before I next head to Bangkok, I have to come over to your blog and jot down your recommnedations. The food looks so good. @icepearlz – I actually maintain a list of recommended restaurant as well as sights to see, hotels to stay at, etc. Please message me before your next trip and I’d be happy to share it with you. @iskrak – Yes, it does remind me of those steamed sticky rice but less glutinous. Let me know when you’re heading this way. @jandsschultz – Yep, already on there. @ZSA_MD – It is already really good but I have no doubt the owner will keep raising the standards. We can include this on your to-try list when you are in town. This sounds absolutely amazing. It’s always exciting when you can find a restaurant that meets at the quality/taste/cost crossroads. This sounds like the perfect place- good food reasonable and a comfortble atmosphere. I envy you. I’m going to have to go eat dinner soon. This post has put me over the edge!